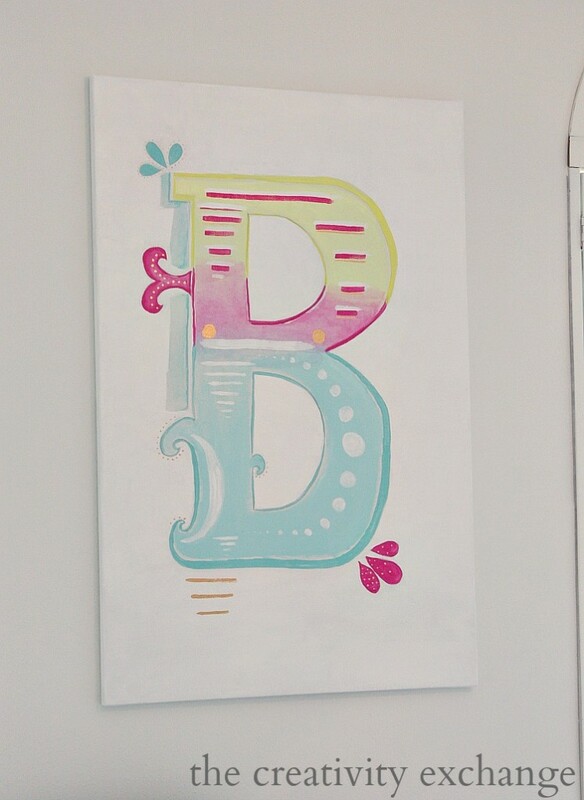 I am so excited to finally be able to show you guys my daughter Bella’s room revamp project. We have been working on it for over a month and it was my goal to have it finished by Bella’s 10th birthday. Her birthday was a week ago and I finished the room the night before her birthday. Spending the last month transforming her room from a sweet little shabby chic girl’s room into a fun and bright tween space has been so much fun for the both of us. I just love her colors and we just couldn’t stop with all of the fun projects! My girl picked all of the colors and patterns for her new room. She wanted bold bright and fun and layered patterns. Ten is interesting age in that they go back and forth between little girl and teenager. I guess that’s why they call it tween. There is little girl mixed with big girl in her new room but the most important thing for me since the day she was born is to surround her with creativity and art. After the bedding came in, I asked her what other colors she wanted in the space and I wasn’t surprised to hear that she wanted hot pink. Although, I was surprised by all of the pattern mixing that she wanted. After we figured out her colors, we went to town revamping her old Pottery Barn little girl furniture. 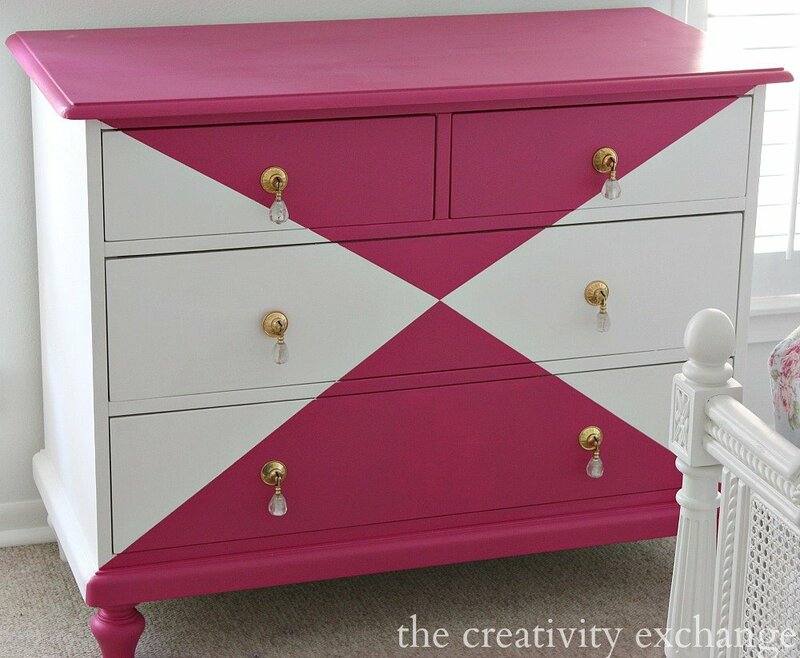 We wanted to use what we had furniture-wise and get creative with paint and fun patterns. All of the painted pieces that you see (everything including the bed), was done with the new Velvet Finishes paint line that I am completely obsessed with. The colors of this paint are so incredibly highly pigmented and the finish is unbelievable. 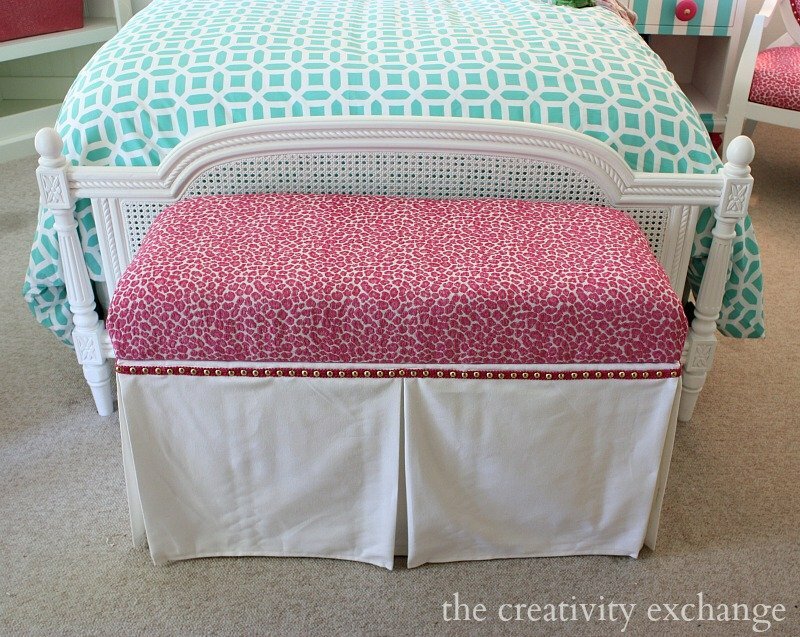 We also transformed my daughter’s old junk toy box into a chic upholstered bench. 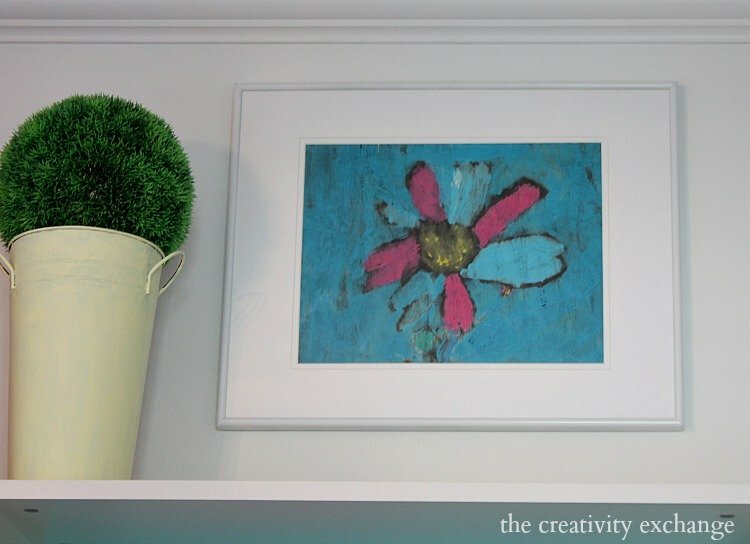 It was such an easy and quick transformation because we used a faux fabric panel trick. If you’re interested in the toy box tutorial that I shared last week, you can find that here. By the way, the dog silhouette is a piece that Bella and I did several years ago of our sweet dog Ava. It was such a fun project for us. You can find that tutorial here. This has been such a fun project and I love that we transformed the space using mainly the pieces we already had in the room. I have several little projects to still share tutorials for in this room and those will be coming up. Bella is so excited about her new room and I’m so glad that she wanted to be so involved in choosing everything. This room turned out stunning! 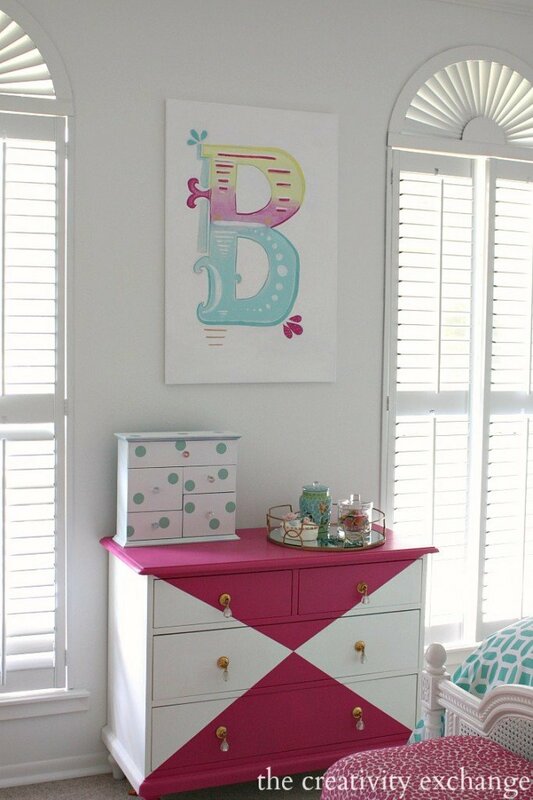 I bet your daughter absolutely adores her new room! that is gorgeous! i love the color combo, the jars from target, and that desk area! I love, love, love this. What a fun and delightful room. The colors are fantastic. 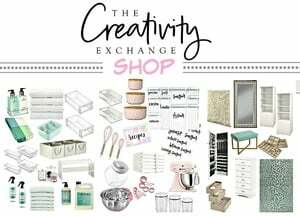 I would love for you to link up to my Inspire Me party this afternoon. Party goes live at 3 PM. Hope to see you there. This belongs in a magazine. I absolutely love it! Wish I had a room this fun when I was a tween! Aw, Thank you so much Lindsay! Bella is loving her new room! What an amazing room! I would have loved a room like this when I was little…heck I’d love it even now. 🙂 That chandelier and the painted furniture I think are my favorite parts. Hope Bella had a wonderful birthday! You are an awesome mom, Cyndy. Love that dog silhouette. I can’t believe I missed it the first time around. I don’t have any little girls, so I miss out on all the fun pink decorating, but my 15 year old son would definitely appreciate that as artwork for his room. In blue, of course. It’s definitely on the to-do list. Great job, Cyndy. I hope your daughter appreciates all your hard work and creativity! Thank you so much Laura! Yes, a dog silhouette is such a fun project to do! It would be so fun in navy or a indigo color for a boys room! If you guys do it, I would love to see a pic of your finished canvas. Thank you so much Laura for your kind words! What a wonderful project to share with your daughter! Every detail is amazing. Bella has inherited her mother’s creativity and style! Best, Beth C.
Aw.. thank you so much Beth! Your words just make me smile. Thank you! Wow! Love how bright and colorful that is! I love the wall of gold dots! 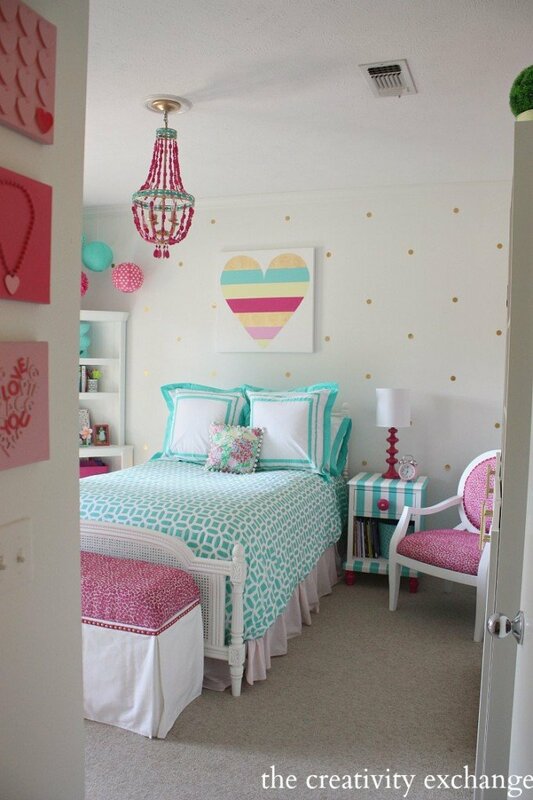 A perfect little/big girl room! I love everything, especially Bella’s framed art work! Awesome mother/daughter team work on the design! You earned a break after all that hard work!! Thanks for sharing all your fabulous ideas! I’m so inspired! Bravo!!! This looks amazing! So happy Velvet Finishes helped make Bella’s room special! Bella is one lucky girl! I love her open bookcase/storage, it’s so glam and girlie! LOVE this room. I recently painted my daughter’s room so I know what you just went through. 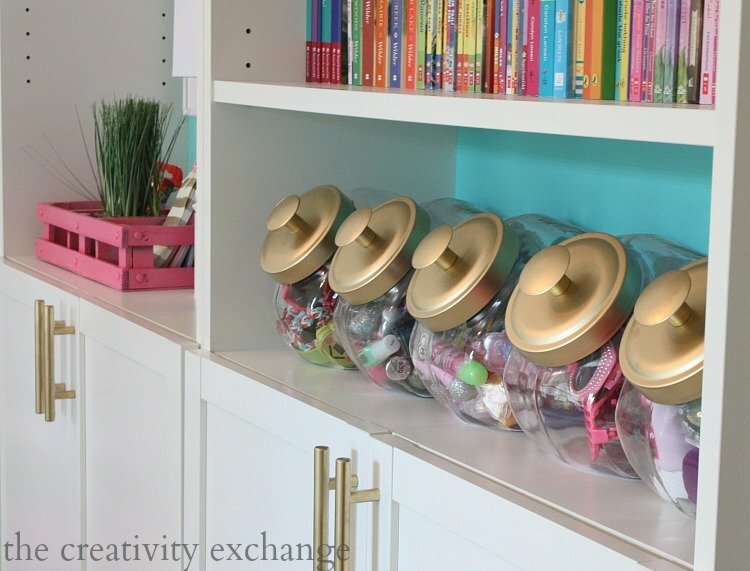 Great idea on the candy jars. Might have to try that! Sharing! Bella’s room is the bomb. The colors are fantastic. Y’all did a terrific job !!!! What a labour of love! It turned out fabulous! 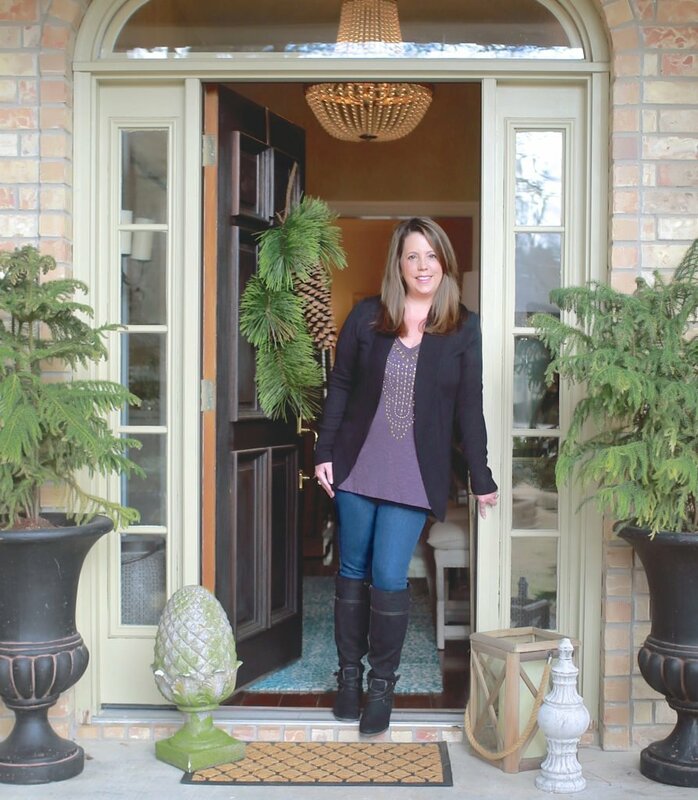 Rivals Teen rooms shown in Home Dec magazines! Be proud of your accomplishment! Your daughter is a lucky girl! Are the dots on the wall painted on or are they stickers? the dots are vinyl Rebecca. You can find them on Etsy in all sizes. 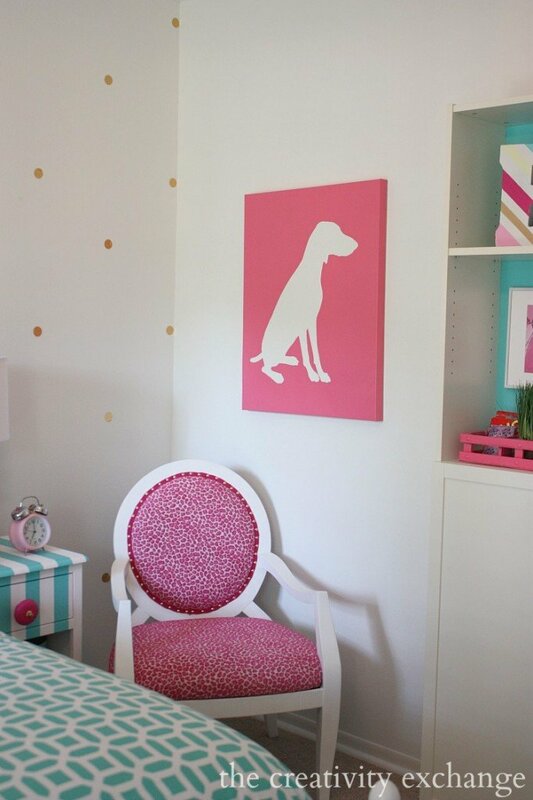 Curious as to what size dots your chose for your daughter’s room? Love it! This is so so cute, Cyndy. My favorite is the dog painting. 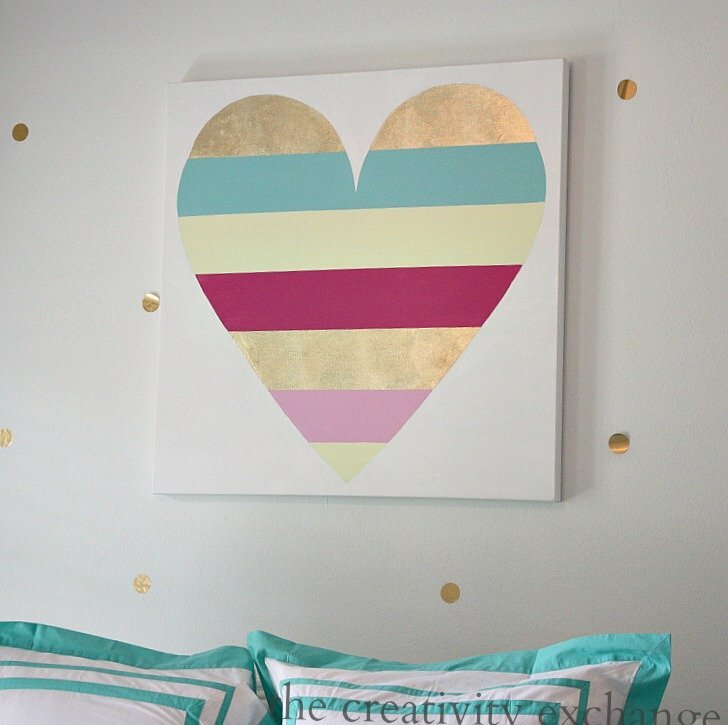 I am actually looking to make a big painted heart for my little girls room just like that one. So when I saw a picture of it on pinterest I came to check it out. You didn’t say how you did the heart, did you just trace the heart as best as possible? Wow Cyndy! This looks fabulous! I would have loved this room when I was growing up. I LOVE this room! 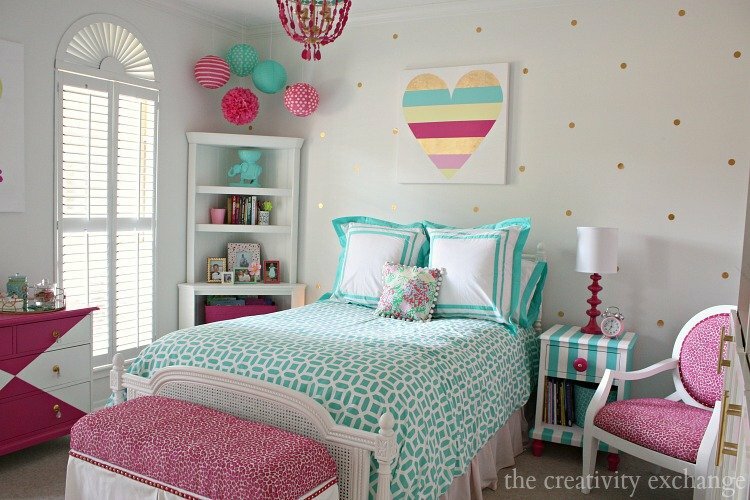 This is exactly how I want to do my daughter’s room in our new house.Can you tell me where you found the gold dots? I have only seen larger ones online and I love this size. Thank you!!! Love this and it came just at the right time as we are in the early stages of re-doing my 9 1/2 yr. olds room. Did you paint the gold dot wall? Very beautiful room!!!!! We’re did you get the sheets and quilt? Thank you Isabella (that’s my daughter’s name too!). The sheets and duvet cover came from either Pottery Barn Teen. The color is called pool. Thank you for stopping by! Thank you. We are trying to do my room too. I forgot to ask you, we’re did you get the side bookshelf were her lab top is sitting? Also I forgot to ask,were did you get the corner bookshelf? Love the room! The Pottery Barn pool color is a great color. QUestion. Does anyone have a suggestion for a wall color to go nicely with the pool? My 10 year daughter wants a similiar PB bedding in pool and is leaning toward a matching tourquise /pool color and that to me is going to make a small room even smaller! Suggestions anyone? Hi I love the gold dot wallpaper, may i ask where you got that? How much would you charge to paint one of those fabulous hearts :)? Thanks! Love the room! I’m curious how you painted the heart and kept it so clean?! Love this room! I’m wondering how big the gold dot decals are? Are they 1 inch and how far did you space them apart? So perfect! Does anyone know what color of paint would match the pool pottery barn stuff? I have seen SW 6486 (reflecting pool) but I just don’t know? Me again! Still wondering about that heart print! Maybe you could do a tutorial? We love this room! 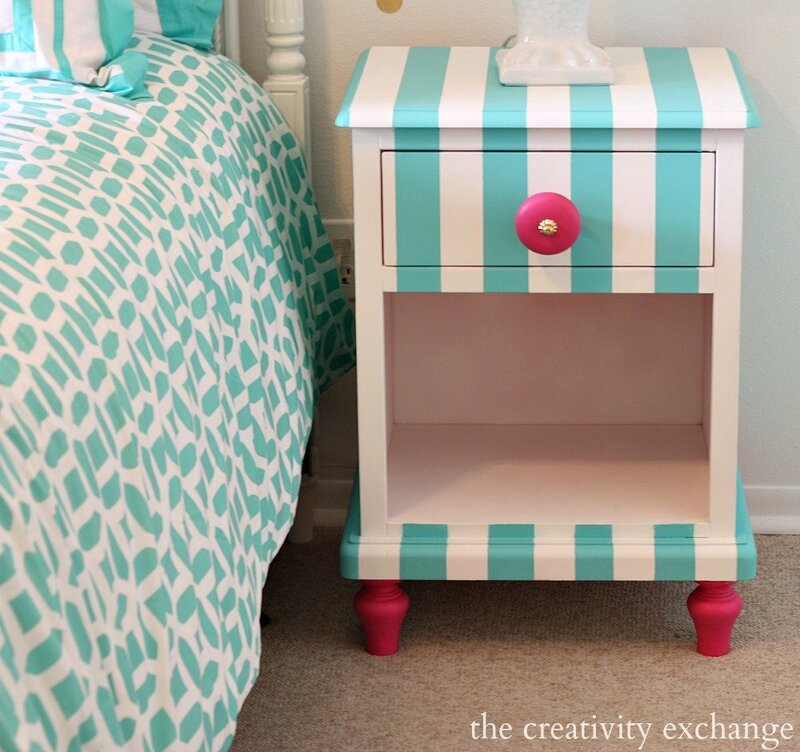 I am doing my daughter’s room in similar colors! Where did you get the paper lanterns? I cannot find the different variations you have and they are just adorable! 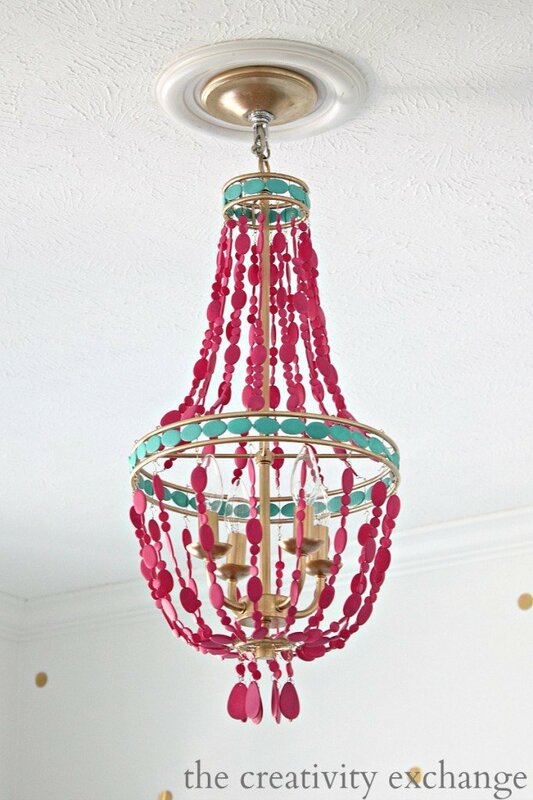 Love the hanging poofs and lanterns! 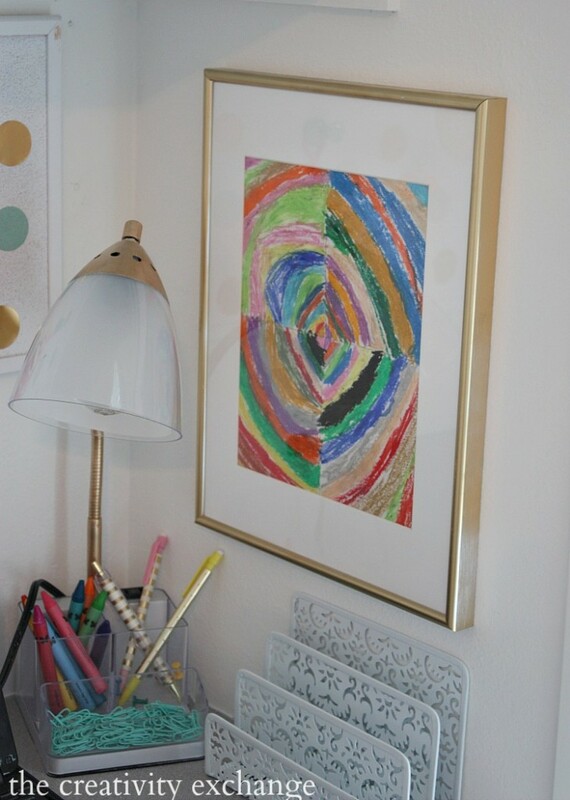 I’m planning this in my daughter’s room, so I enjoy seeing how others have done them…thanks! What size canvas did you use for the heart painting? ? 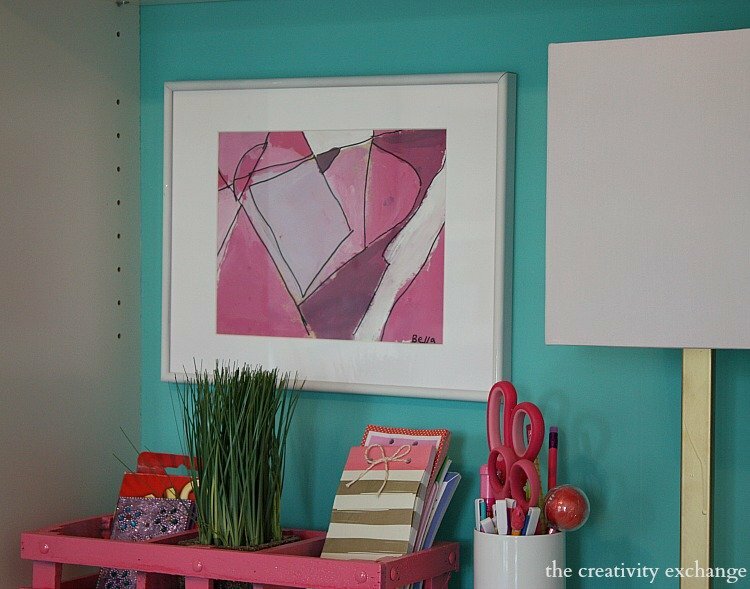 Would you mind sharing or emailing the colors you used and sizing for your heart painting? It is beautiful! Thank you! First off, your daughters room turned out amazing! Did you use a stencil for the gold polka dots? If so, where did you get it from? Thank you! Love the Billy shelf. Would be perfect for my child’s room. What are the doors you used on this? Thanks for the idea ? Love the heart canvas too! Which size canvas and did you free hand the heart?? What size are the paper lanterns? Where did you find the chair that sits in the corner next to her bed. I love this chair. 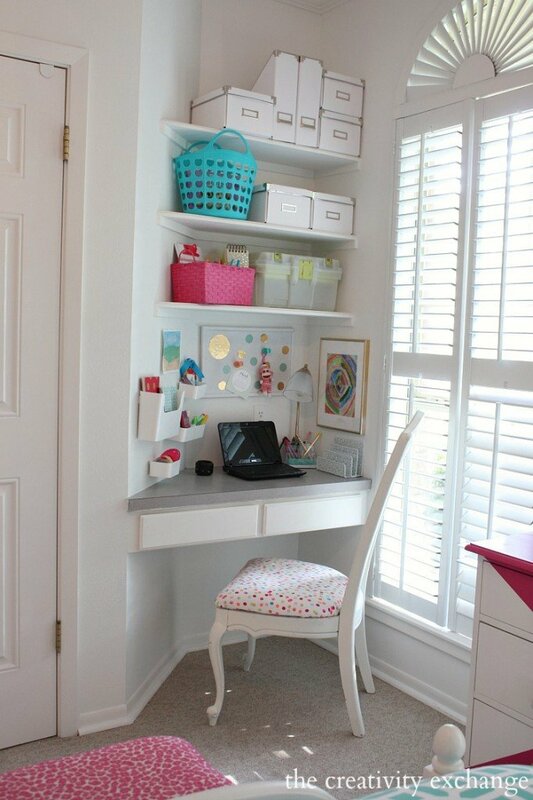 Is the desk in the corner a DIY project or did you buy it?? We are looking to do something like that in our office !! Would you consider making/selling me a dog silhouette exactly like the pink one? Hi Liesel. I’m sorry but I don’t make them for people. I don’t have the time. The process is very easy if you follow my tutorial. Thanks for your note! Where did you get that hutch?! 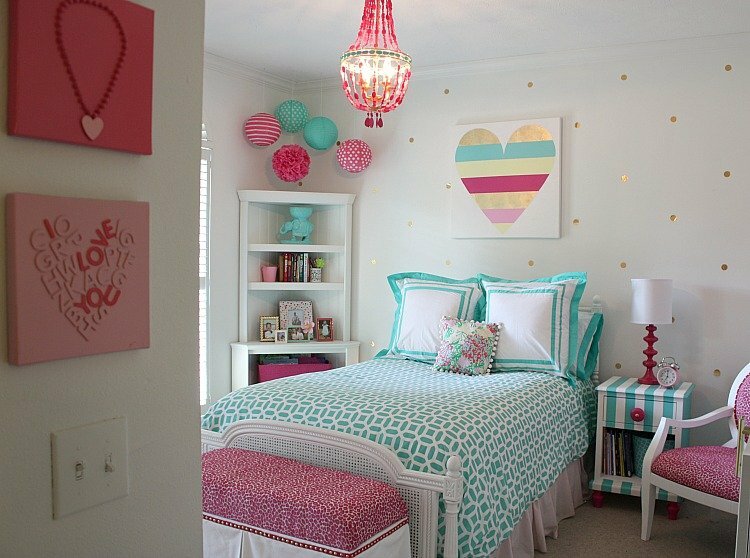 Cute room!! Where did you get that hutch? Hi! Can you please tell me about the wall behind the bed? Is that wallpaper? If so, can you please share the manufacturer and pattern? Thanks! I know this a 4-year-old post, but my granddaughter has chosen this room from the hundreds on Pinterest as inspiration for her room that we will complete together. I have been unable to find reference to the wall color. Do you mind sharing? Thanks so much. Glad I found your awesome blog!